Situated in Kitsap County a short walk from the shore is this beautiful 2-bed, 2-bath vacation rental house in Indianola. This 2-story home sleeps 6, features a lush backyard, and boasts 1,228 square feet of well-appointed living space. Easily walk to the local stores or cruise 20 minutes west to historic Poulsbo - home to seasonal events, clamming & fishing spots, and tons of Nordic charm! The Bainbridge Ferry is 30 minutes south of this home, so excursions to downtown Seattle will be a breeze! Known for its flat, silky sand beach and historic dock, Indianola is a peaceful coastal retreat for travelers of all ages. Easily park your car in the driveway and step inside to unwind! Hardwood floors lead you into the living room filled with an abundance of natural light. Search for your favorite shows or news channel using the flat-screen cable TV. Send your designated sous chef out to the Indianola Country Store just steps away from this home to pick up specialty food items, souvenirs, gourmet coffee, ice cream and deli items. Once they've returned, prepare a feast in the fully equipped kitchen with ease! Weather permitting, dine at the covered picnic area just down the street from the home. Plan your next trip to Poulsbo for farm-to-table ingredients showcased at the 2.5-acre Central Market or walk over to the community clubhouse for a movie screening. If boating, fishing, crabbing, or clamming is on the agenda for tomorrow, get some much needed rest in one of the 2 bedrooms. A twin sleeper is also available in the living room, accommodating an additional guest. You're sure to enjoy a variety of family-friendly activities while in Indianola, where the trails and roads are ideal for morning strolls through the coastal neighborhoods. Enjoy the smooth sand on the beach when you walk to the access point just minutes from this home! Neighboring Poulsbo has a historic downtown area with over 65 storefronts featuring a Nordic & Viking theme. Attend a summer event, tour the SEA Discovery Center, or dine with views of Liberty Bay. For an easy trip to the big city, catch the Bainbridge Island Ferry, located 30 minutes south of this home, to head to Seattle. The ferry terminal is on Seattle's Fisherman's Wharf - the premier tourist area of Seattle boasting waterfront shops and restaurants, & the nationally acclaimed Pike's Place Market. Additionally, the Kingston Ferry is only 15 minutes from the property and takes you right to Edmonds! Outdoor enthusiasts won't want to miss out on the hiking trails, waterfalls, and natural hot springs in the Olympic Mountains. Find out how to access this preserved mountain range when you stop in the local visitors bureau - Visit Kitsap Peninsula - 25 minutes away in Silverdale. If you're looking for a day trip, be sure to visit the charming Victorian port of Townsend, where "Officer and a Gentleman" was filmed. Bring your passport and cruise into Canada by way of 2 ferries en route to Victoria. Movie buffs might also enjoy a trip to Forks, where the Twilight Saga movies were filmed. 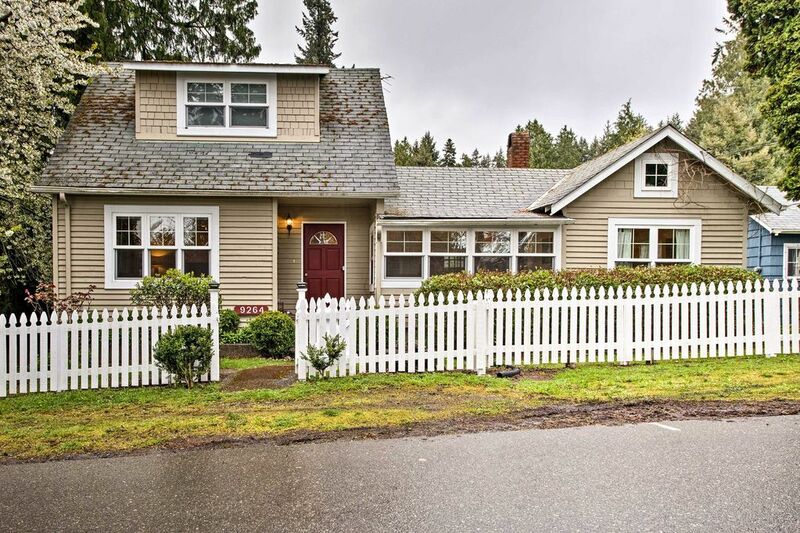 - Prime Indianola location a few blocks from shops, restaurants, and the old ferry dock, easy access to outdoor recreation such as swimming, fishing, clamming, & whale watching in Poulsbo just 20 minutes away! Great house. Great, great location. Great location... beautiful setting. Short walk to the water and to a cute little country store/deli. Short car ride to the Edmonds ferry. Quaint cottage within walking distance to beach! It was a great place for our family to stay. My sister and her daughter, son in law and 2 grandkids live 5 houses away. We were able to visit them but still have our own place to stay. We visited the Air Museum which was awesome and went Salmon fishing. We caught our limit and fixed Salmon for dinner. WE enjoyed our stay in Indianola. The cottage was in good condition and comfortable for our family. We will come back!